There are 11 Assisted Living Facilities in the Summerville area, with 6 in Summerville and 5 nearby. The average cost of assisted living in Summerville is $3,706 per month. This is higher than the national median of $3,346. To help you with your search, browse the 60 reviews below for assisted living facilities in Summerville. On average, consumers rate assisted living in Summerville 3.8 out of 5 stars. Better rated regions include Goose Creek with an average rating of 4.4 out of 5 stars. Caring.com has helped thousands of families find high-quality senior care. To speak with one of our Family Advisors about assisted living options and costs in Summerville, call (855) 863-8283. Summerville is located on the northeast border of North Charleston and is the host of the annual Flowertown Festival, which is the largest arts and crafts festival in South Carolina. The low cost of property taxes in Summerville make it attractive to young families, resulting in rapid growth with a relatively low senior population of 12 percent. However, this area still has 27 assisted living facilities, including six in Summerville itself and the other 21 in nearby cities like North Charleston and Goose Creek. These facilities also provide seniors with assistance in personal care and other daily living activities. 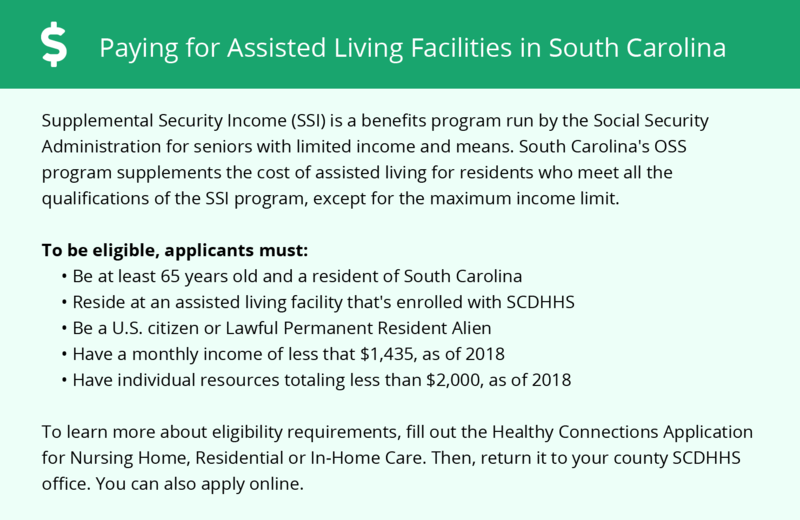 The South Carolina Department of Health and Environmental Control regulates the licensing of assisted living facilities, which it calls community residential care facilities. Summerville has a high comfort rating of 75 on a scale of 1 to 100, meaning it has a large number of days with temperatures in the 70s and low humidity. The average low temperature is 36 degrees in January, and the average high temperature in July is 91 degrees. Seniors will find this climate allows them to spend time outdoors throughout the year. The overall cost of living in Summerville is less than one percent above the national average. However, utilities and groceries are 14 and 8 percent above the national average, respectively, which impacts residents' budgets for incidentals. Summerville has a high crime rate that makes it safer than only 11 percent of all U.S. cities. Its total crime rate is 39.74 crimes per thousand people per year, which is slightly greater than the average of 37.46 for South Carolina. Senior citizens in Summerville should focus their security precautions towards property crimes, rather than violent crimes. The Charleston Area Regional Transportation Authority provides mass transit for the Charleston Area, including direct service from Summerville to downtown Charleston. Seniors 55 and up pay less than half the regular fare during non-peak hours. This transit system also offers senior days occasionally, when seniors can ride for free. The Dorchester Senior Center provides a variety of activities for seniors, including arts & crafts, games, fitness and education. It also offers volunteer programs, auctions and in-home services. This senior center serves hot lunches Monday through Friday. The Summerville area is home to world-class medical facilities, including Summerville Medical Center, in the event of medical emergencies or illness. Assisted Living costs in Summerville start around $3,706 per month on average, while the nationwide average cost of assisted living is $4,000 per month, according to the latest figures from Genworth’s Cost of Care Survey. It’s important to note that assisted living rates in Summerville and the surrounding suburbs can vary widely based on factors such as location, the level of care needed, apartment size and the types of amenities offered at each community. 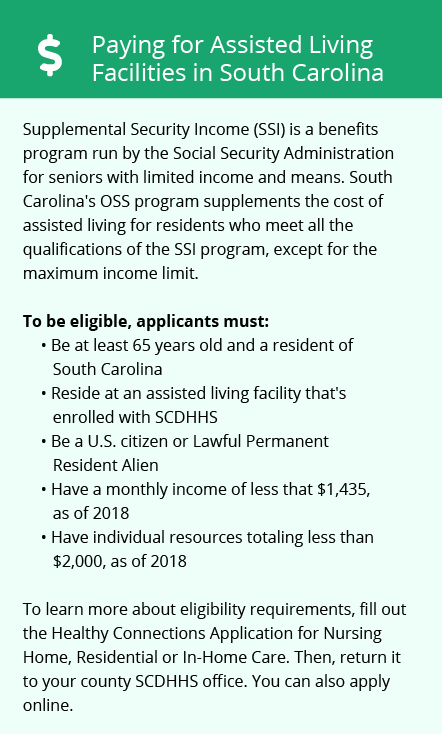 South Carolina offers a Medicaid program called the Community Choices Waiver, that includes assisted living for senior citizens. It allows individuals who would otherwise require a nursing home to receive assistance with their daily living in a community setting or their own home. Summerville and the surrounding area are home to numerous government agencies and non-profit organizations offering help for seniors searching for or currently residing in an assisted living community. These organizations can also provide assistance in a number of other eldercare services such as geriatric care management, elder law advice, estate planning, finding home care and health and wellness programs. To see a list of free assisted living resources in Summerville, please visit our Assisted Living in South Carolina page. Summerville-area assisted living communities must adhere to the comprehensive set of state laws and regulations that all assisted living communities in South Carolina are required to follow. Visit our Assisted Living in South Carolina page for more information about these laws.